Just as the sacred liturgy is the source and summit of the Church's life, so are the sacraments our most solemn form of liturgy. The Catholic people celebrate 7 sacraments: Baptism, Confirmation, Holy Eucharist, Penance, Anointing of the Sick, Matrimony and Holy Orders. In the Sacraments, Jesus Christ makes himself manifest to his people: the sacraments are "efficacious signs of grace perceptible to the senses". Through them divine life is bestowed upon us. They make real the mysteries they symbolize. "What was visible in the life of our Savior has passed over into his sacraments." The sacraments not only presuppose faith but with words and ritual elements they nourish, strengthen, and express it. By celebrating the sacraments, the Christian people profess the faith that comes from the apostles. This explains the origin of the ancient saying, “lex orandi, lex credendi,” that is, the Church believes as she prays. In the sacraments the Church already receives a foretaste of eternal life, while “awaiting in blessed hope, the appearing in glory of our great God and saviour Christ Jesus” (Titus 2:13). To baptize means to “immerse” in water. The one who is baptized is immersed into the death of Christ and rises with him as a “new creature” (2 Corinthians 5:17). This sacrament is also called the “bath of regeneration and renewal in the Holy Spirit” (Titus 3:5); and it is called “enlightenment” because the baptized becomes “a son of light” (Ephesians 5:8). With this sacrament, the Church Universal confirms what was done locally in baptism: confirmation celebrates the baptized Christian's membership in the Church. It is also called Chrismation because the bishop anoints with holy oil. Confirmation It roots the believer more deeply as a child of God, binds him/her more firmly to Christ and to the Church and reinvigorates the gifts of the Holy Spirit in his soul. Also called Communion, the Breaking of the Bread or just "Mass", the Eucharist, the contains the whole spiritual good of the Church, Christ himself. 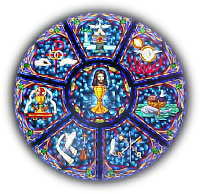 Communion with divine life and the unity of the People of God are both expressed and effected by the Eucharist. Through the eucharistic celebration we are united already with the liturgy of heaven and we have a foretaste of eternal life. the building up of society. Christ restored the original order of matrimony and raised it to the dignity of a sacrament. Click here for more about marriage in the Catholic Church. Christ instituted this sacrament for the conversion of the baptized who have been separated from him by sin. In it, the People of God celebrate the forgiveness which the individual sinner has received from God. It is also called Confession, Penance and the Sacrament of Forgiveness. Any member of the faithful can receive this sacrament as soon as he or she begins to be dangerously ill or has reached old age. The faithful can receive the sacrament several times if their illness becomes worse or another serious sickness afflicts them. The celebration of this sacrament should, if possible, be preceded by individual confession on the part of the sick person. Although a funeral is not a sacrament, it is part of the pastoral care which Catholics owe one another.